The more a man’s tongue flees verbosity, the more his intellect is illumined so as to be able to discern deep thoughts; for the rational intellect is befuddled by verbosity. Prayer is the flower of gentleness and of freedom from anger. Take care that, while appearing to cure someone else, you yourself do not remain uncured, in this way thwarting your prayer. If you endure something painful out of love for wisdom, you will find the fruit of this during prayer. If you long for prayer, renounce all to gain all. “I want to repeat my willingness to assume as a fundamental commitment working to reconstitute the full and visible unity of all the followers of Christ, with all my energy,” he said to applause from the estimated 200,000 people at the Mass. Words aren’t enough, he said, adding that “concrete gestures” were needed even from ordinary Catholics to reach out toward the Orthodox. “I also ask all of you to decisively take the path of spiritual ecumenism, which in prayer will open the door to the Holy Spirit who alone can create unity,” he said. Will Benedict truly symbolize the humility that a leader of Christians must possess? The rift comes partly through theology, but mostly through pride of power, something that has become entrenched over the last 1000 years, as one Christian wants to rule them all. This isn’t just an issue with the Catholic Church, even the smallest Baptist Church has this sin, where one person wants power and the others invest in him the authority by turning over their being. This may be a curious time to be a Christian, if the unity is truly based on a work of the Holy Spirit who brings unity out of diversity, rather than a work of humanity which tends to force an apparent unity through conformity. It is said that Benedict did not want to be Pope. That is the best kind of Bishop to have, methinks. Maybe Benedict is a successor to Gregory I, rather than John Paul II. This is worth a prayer, as Christian unity is not only a fine idea, it’s really a Scriptural mandate. This is curious because in a way I shy away from organized religion while remaining very orthodox within a specific organized religion. It’s not the organization, it’s the fact that I really, really believe what the organization is all about. Eddie Albert died today. He was 99. Best known for his work in the old sitcom Green Acres, it seems there was a lot more to the man than cheesy television roles. Each page of his obituary made me like him more and more. A good man has died, a man who did a great deal in helping save that which I presently enjoy. There’s not too many people who I see and think I wouldn’t mind a life like their life… it seems Eddie Albert had one of those lives I wouldn’t mind living. Key details, of course, I don’t want (neither the stage nor the screen hold any appeal for me)… but how he spent his time and how he spent his energy seem to be well worth emulating. His was a life worth living, something far too many people can’t say about their own lives. In this is the secret of contentment methinks. I walked out onto my balcony to bask in the evening breeze. I looked up, where I thought I had looked up fairly regularly. 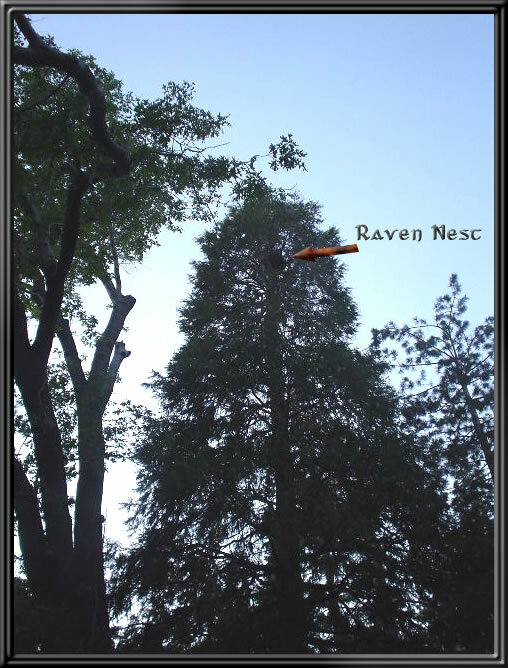 My suspicions were confirmed when I heard a raven caw an hour later, and I watched it circle the nest and hop in. Twenty feet away and fifty feet up our resident ravens are settling in for parenthood once again. I knew they liked garlic bagels. I didn’t know they liked them enough to move to the immediate neighborhood. picture Comments Off on What has happened here? The EU Constitution is very unpopular. We ought to learn the virtues through practising them, not merely through talking about them, so that by acquiring the habit of them we do not forget what is of benefit to us. ‘The kingdom of God’, St. Paul says, ‘resides not in words but in power’ (I Cor. 4:20). For he who tries to discover things through actual practice will come to understand what gain or loss lies in any activity that he pursues. Should someone claim that only absolute Being is a participable principle since it alone does not participate in anything but is solely participated in, whilst the other participable principles participate in it, he should know that he does not think aright with regard to the other participable principles. Some monastic writings are, ahem, more practical than others. Some require a pick and axe to get the gold.